Today, I began sorting the pictures I scanned at Mama's week before last. This was one of the first I encountered - it's Uncle Jakie as a baby!! 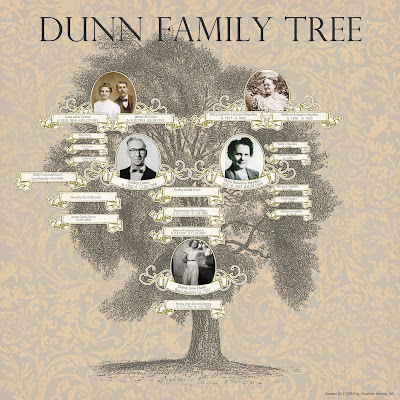 You may remember that Granddaddy was married to Ruby Linwood Dodds and together, they had two children - James D. Dunn and Dorothy L. Dunn. 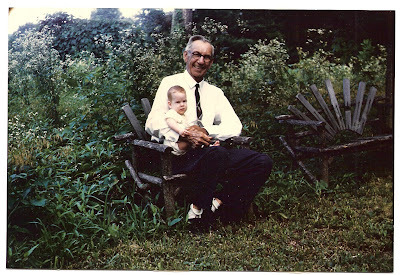 This picture is of JD Dunn (baby) on his maternal grandfather's lap, with his great grandfather, Frank McElroy seated to his left. That's Granddaddy standing. 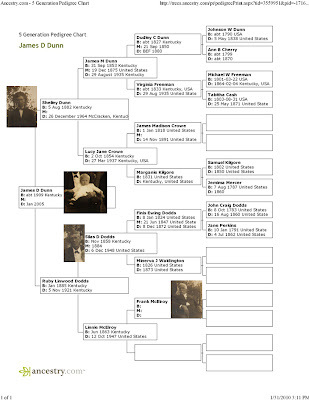 Because this was a little hard for me to piece together, I've included a piece of the family tree below. If you click on the image, you can view it full-size. How do you make cornbread? Do you add a "splash of water" after mixing in the buttermilk? Mama and I agree that last little splash of water makes the cornbread more fluffy. She said Maudie always added a little water to her cornbread. We wondered if Maudie added the water to make her cornbread more fluffy OR did she add it because she was running short of buttermilk? Either way, I always add a "splash of water" to my cornbread (and Tim does the same for his pancakes). And every time I add that splash, I think of Maudie. One of the things I had hoped to find as I gathered old pictures was to see what Maudie's husband looked like. Here he is, William Edward "Ed" Hayden, Jr. He's standing behind Maudie (Mary Isabelle, "Mayme"). 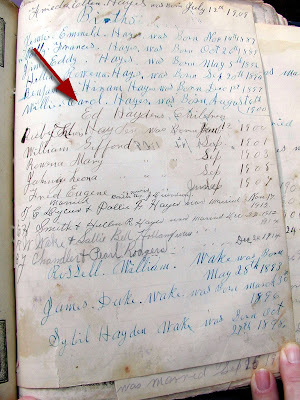 Seated to Maudie's right is her father-in-law, William Edward Hayden, Sr. He is holding someone near and dear to our hearts, Mary Rowena Hayden (Dunn). 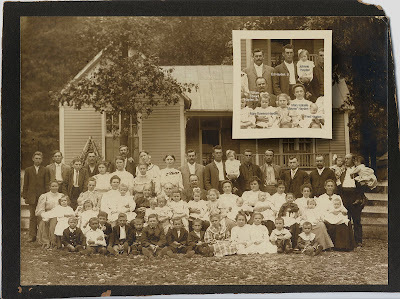 I added the close up picture inset in the family picture and I added the red arrow above. The way I see it, once I've figured out how Pete's information relates to us, I'm going to create an additional version that makes it easier for us to relate to. 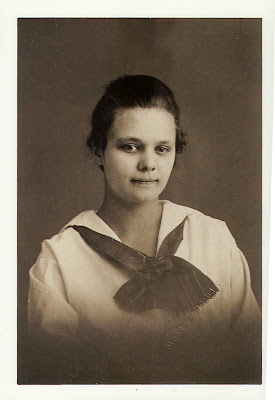 Pete had made some notes, and this one said "Rowena Hayden portrait, circa 1918". This picture was scanned by Pete Cannon. 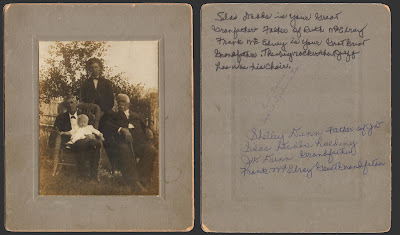 His notes say, "Mary Isabelle (Cannon) Hayden seated on the lawn with Ruby holding her doll, and Fred, circa 1910." My Mama told me to pick this very one. O....U....T..... you dirty dishrag YOU! 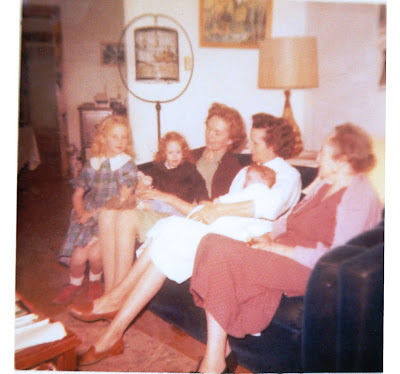 While not all my family members remember Maudie as the kind, nurturing great-grandmother who patiently colored and played games, that is who MY Maudie was. And William Trimbletoes was one of the games she played with me. It was a finger-counting game. I'd spread my hands out and Maudie (also Mama) would gently touch each of my little fingers as they recited the rhyme. The finger that was "out" was then folded under my hand - missing from the next countdown. I googled William Trimbletoes, just for kicks, and found lots of references. And in case you don't recognize the little toes here, they belong to Shelley's babies: Evan, Nate, and Lizzie. Thought the toes of a new generation would be a most appropriate image to use in illustrating their great-great-great-grandmother's finger counting game. William Trimbletoes - You were fun! There was only ONE fishpond at the funeral home. Grandmother Rowena ordered the supplies for the pond. How in the world she received live fish....who knows!!?! It's simply delicious! Tim, Sarah, and David all loved it. Will definitely make it again. 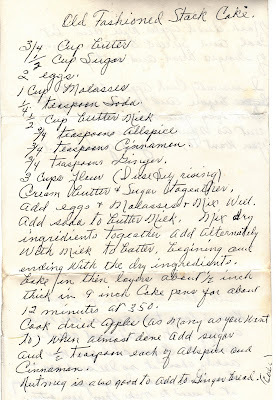 Wish I could write Grandma and thank her for her recipe. 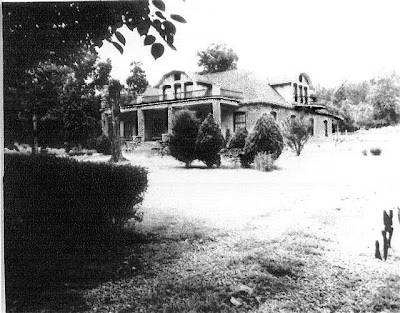 Across the road from the Little White House was Dunn Funeral Home. 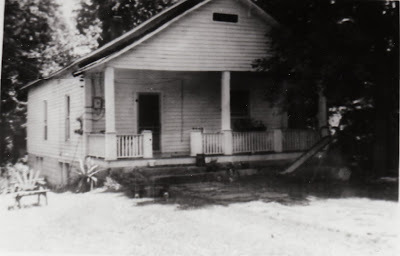 Grandmother and Granddaddy lived in the left half. The right half was the funeral home. I think that the piano we all learned to play sat in the central hallway. These pictures must have been taken when the funeral home was new because there are no fish ponds in front. There were two large, rectangular, concrete fish ponds on either side of the walkway. 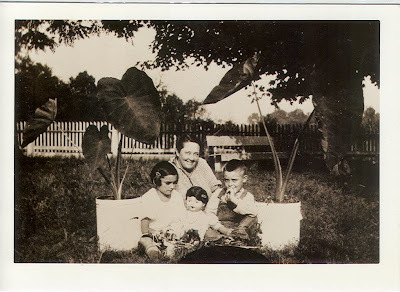 Grandmother had goldfish and lilies in the ponds. Seems to me that the goldfish were HUGE!! Big enough to bite a chunk out of your leg. But then again, I was pretty young. I spent a fair amount of time here with Maudie. 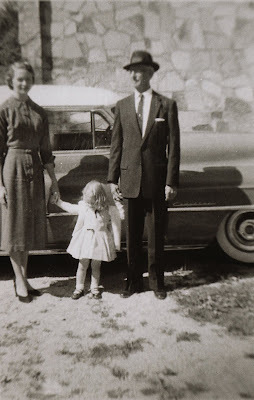 Mama had the flower shop, Daddy was working for Grandmother and Granddaddy, and Maudie played with me. Coloring with her was the best. She made me feel like she had nothing better to do than to be with me. She was wonderful. I wish you all could have known her. Her funeral was the first one in the "new" funeral home in Eddyville. 1962. This picture was taken in the living room. You'll recognize the birch tree picture on the wall as one of the many Paint-by-Number pictures that Grandmother painted. I believe that's the dining room through the doorway and the kitchen beyond that. The kitchen opened onto a porch and there's a picture somewhere of Uncle Kenneth turning the crank on an ice cream maker and Aunt Katherine in pin curls. She was trying to avoid the camera, but no such luck. Hopefully, that picture will turn up, too. On Easter, we would all go to church and then come here for Easter dinner. While we were at church, the Easter bunny would come and hide our eggs. All of us, all the cousins, would then head out looking for eggs. One Easter, we were playing shadow tag. I jumped on Karen's (cousin) shadow. She jumped backward and.........FELL INTO THE FISHPOND! Yes, she fell right into the 200 foot deep fishpond with the killer, whale-sized goldfish! All the grownups came running, got Karen out. Truly if she had worn the heavier coat that Aunt Katherine told her to (yes, Karen disobeyed), she may have drowned, or been eaten by the goldfish, or something even worse! I felt that it was my fault that she fell, but she was never mad at me about it. She knew I didn't mean to make her fall into the fishpond. 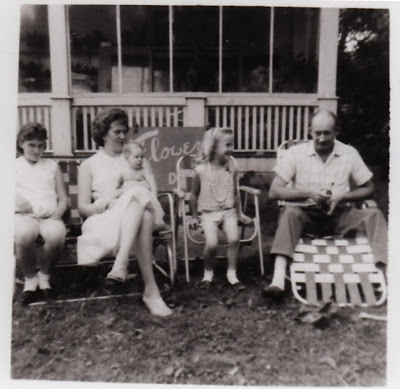 This picture came from a CD that Mama and Bill had of photographs from Old Kuttawa. It looks as if it was a picture for the newspaper. 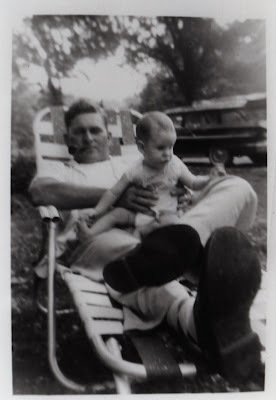 Cindy had a great picture of her as a baby with Granddaddy. 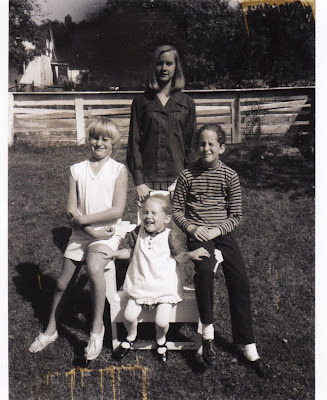 I checked with Mama and confirmed that this picture was taken in the sideyard of the little (and I do mean little) white house we lived in when both Cindy and Rose were babies. Because you were both so little when we moved to "New Eddyville", putting your picture in context of that little house may give you a new perspective. I remember this furniture. I have it associated with "Diana's Flowers". 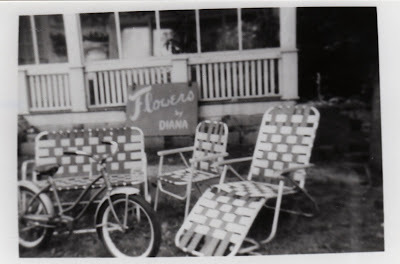 Mama speculates that is because the furniture and the sign for her business were in the same yard. Uncle Kenneth and Aunt Katherine lived in the little white house before we did. They moved out and onto Granddaddy's farm. 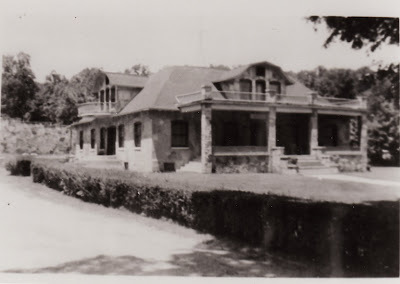 We moved in and lived there until the TVA made Barkley Lake, about 1963 (I was in third grade). It was when we moved to New Eddyville that we transferred our church membership from the Baptist Church in Old Kuttawa to Eddyville First Baptist. 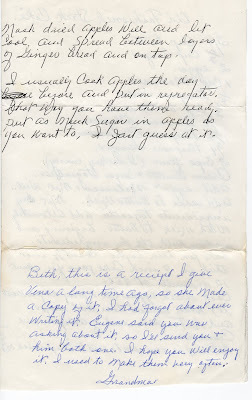 Can you see the reflection in the glass on the coolers Mama had on the front porch for her flower business? Since this post began with Cindy, it's only fitting that it end with a picture of her. Cindy and Uncle Hershel. This picture has our car in the background, and at the corner of our property, beside the car, was a sink hole. The sink hole had, what were in my 6-yr-old opinion, beautiful orange day lilies growing in it. I was afraid that if I ever fell into the sink hole that I would wind up somewhere close to China or die or something else that would be equally horrible. 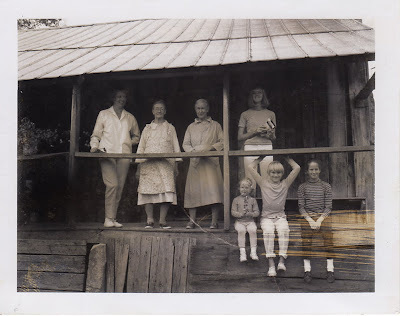 There are no pictures that better illustrate our Appalachian heritage than from when we visited Aunt Gertie and Mertie. The picture of us on the porch is a familiar one. 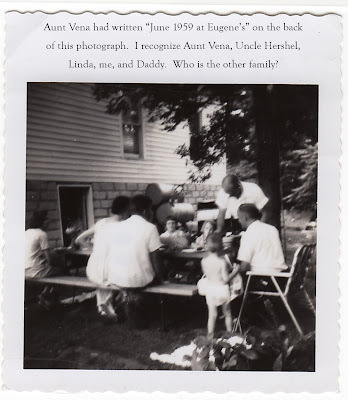 The other, I copied from Aunt Vena. Do your remember Grandma's kitchen at the store? Do you remember the stove? The warming well where she's put the biscuits, waiting for us to wake up? hmmmmm... making myself hungry! The expressions on our faces make me laugh every time I look at this picture. Seems it was a photographic rule to line people up and have them face the sun. Good for squinting! You all crack me up! And why am I not squinting, too? I'm guessing it's because my eyes are totally closed! We are at Grandma and Grandpa's. You can tell by the fence in the background and the white Adirondack chair. What you may not know is that Daddy and Grandpa made those chairs. 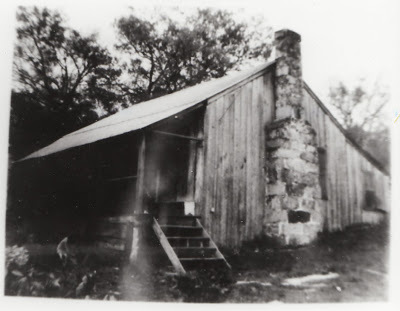 You also may not know that Daddy and Grandpa built the house, too. I'm not sure how much of the house and store they built, but I have some recollection of Daddy telling me about building it. This picture was probably taken with Daddy's first Polaroid camera. The scratches on the pictures look like what would have happened when the undeveloped picture was removed from the camera. I chose not to fix those scratches - I like them - adds character. Somehow I've wound up with all of Daddy's cameras. Tuesday I took pictures of them. I thought it would add interest (at least for me) to have a visual image of the cameras that captured us at different stages of life. I also have the camera Grandma used. And my first camera, too. Sisters. Four of us. 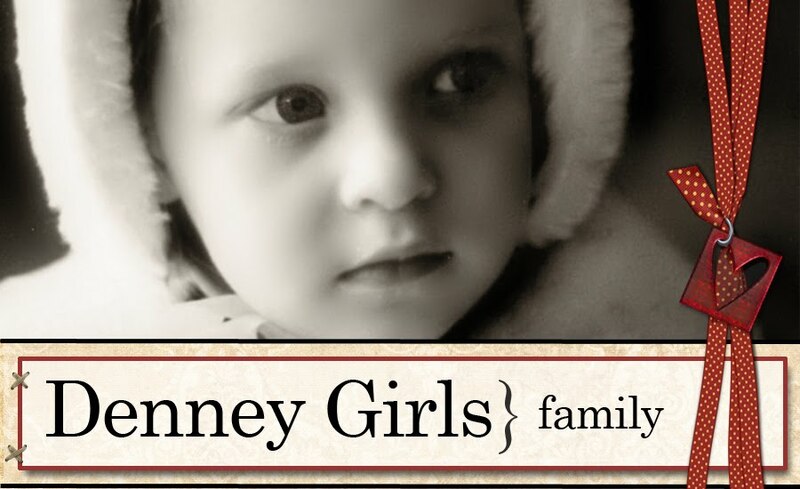 And although there is a pretty wide span in our ages, we were often referred to collectively as "The Denney Girls". 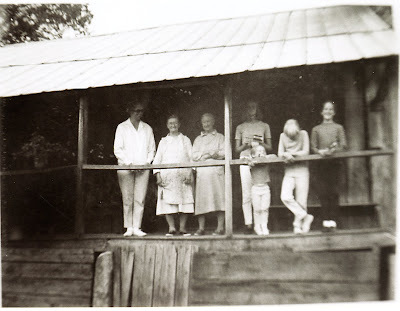 BTW: The little girl in the header is Shelley, taken during the construction of Mama's house on the lake. Somehow, I've become the keeper of family photographs. I suppose it's because I've loved taking pictures ever since I received my first camera (Christmas 1967-ish). I don't, however, want to be the sole keeper of memories. I'd love to include your memories, too. So comment. Share. We are family.